Less than two years after cofounding the video website #waywire, Newark mayor and New Jersey senatorial candidate Cory Booker is stepping down from its board. Booker, whose social media omnipresence and high-profile personal heroics have helped him become an online celebrity, used his star power to launch #waywire as an outlet for young people who care about what happens in their communities. But now that Booker is headed to Washington and #waywire is down to just one of its three cofounders, what’s the future for this company—a company whose platform is still in beta? Originally founded as an alternative to mainstream media for millennials, #waywire set out to blur the lines between social media and social action. As it becomes an integral part of American political life, how is social media being commodifed for players in public policy? And is there danger in public figures controlling social media outlets for political gain? Facebook cofounder and CEO Mark Zuckerberg’s entries into political life—like his immigration reform advocacy group FWD.us—have gotten press and donors because of his financial and social clout. Zuckerberg (at least for the moment) doesn’t appear to have ambitions for political office. But with the data goldmine that is Facebook, having control over that much user information puts him in an excellent position to help his donors reach the people—and votes—they need to effect change in policy. And President Barack Obama’s 2008 and 2012 electoral campaigns used the power of big data to organize the most powerful and effective voter initiatives ever seen. But as a candidate for Senate, owning stock in a for-profit startup could have put Booker in a delicate position. And reports that #waywire is still soliciting investors could lead to the perception that, if Booker wins the Senate seat, he could use his company to directly influence media coverage of his office and the policies he advocates as a senator. Selling his shares and stepping down from the board of #waywire doesn’t mean he no longer has a stake in the company’s success. Media and politics aren’t supposed to mix, but it’s become impossible to disconnect the two; New York City Mayor Michael Bloomberg’s financial and media empire is just one example of how control over a major media outlet can give a politician an arguably unfair advantage in office. Social media can give voice to the marginalized, but controlling the media is a much more effective way to control a message—and while #waywire is still small (and shrinking), investors could find the platform useful in the future. 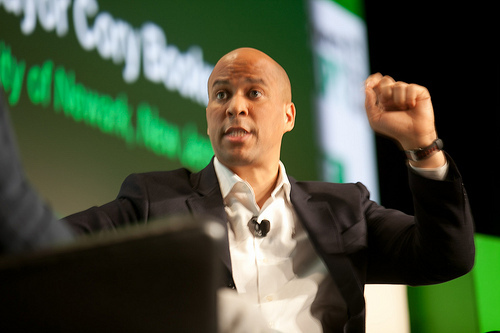 The future of #waywire is uncertain, especially with Cory Booker’s rise in political stature; but a public figure with feet planted firmly in the tech world and the political world can teach us lessons about how social media can help propel a person and his ideas on the national stage. With its pivot from content creation to curation, it seems that #waywire’s focus has shifted from giving people power to speak to encouraging conversations instead. Booker’s former business venture could be just one more media outlet that helps shape how a politician is received by the media—for better or worse.